It’s finally happened. Amy and Sheldon have done the “dance with no pants” as Sheldon likes to put it. But the craziest part is that no one even addressed it on the show’s first episode back. This is an event that we’ve literally waited years for, and not one peep from anyone. Instead, we see a meteor being named, Stuart finally moves out of Howard and Bernie’s place and Penny just might be turning into Leonard’s mother. It was a good episode back, but again, I’m sure everyone was dying to know the details of Amy and Sheldon’s first night together. We begin at the boys’ apartment. Penny is struggling to make a sales appointment with psychiatrist Dr. Gallo, and she turns to Leonard for help. Maybe he can schedule a fake appointment and put in a good name for her. But what would he talk about? He obviously has no problems. According to his friends, however, he has plenty to work with. Low self-esteem, social anxiety, sexual insecurity are all just the tip of the iceberg. Enough said. He finally agrees to go. The session is surprisingly enlightening. Turns out Dr. Gallo is familiar with his mother’s work in the field. And the best part? She entirely disagrees with her child rearing ways. Leonard then lets it all out, including the fact that he never celebrates his birthday because his mother believes his birth is her achievement, not his. Till this day, he still sends her a card every year with a little bit of money in it. It’s an intense appointment, but he scores a meeting for Penny with the doctor. In return, Penny has to promise she’ll also go see a doctor, but one who travels through space and time. There’s a Doctor Who convention coming into town and Leonard is making her suffer, but not as much as Dr. Gallo does at their meeting. The Doctor is less interested in Penny’s pharmaceutical drugs and more interested in her relationship with Leonard. The way she took advantage of him and used him to get her the meeting is something Leonard’s overbearing mother would do. An impromptu session then ensues. How could she not act out when she’s got Star Wars toys filling up their bedroom and a man-child living with them? Point taken. Speaking of man-child, Sheldon is free to be entertained this weekend because Amy is away at a neurobiology convention. Is anyone ready to get there Sheld-on? As tempting as that sounds, Leonard would prefer to get his Sheld-off, Howard and Bernie are getting the house ready for a remodel and Raj is spending some time behind the telescope to look for rogue planets. Naturally, Sheldon opts for the last option. As Raj is working, Sheldon is like a kid looking for something to do around the office. Raj then gives him the task of going through a hard drive containing data from the last six months to see if there are any patterns or anomalies. It’s something to keep him busy for a couple of hours…or maybe 10 seconds. He literally found an optical transient in seconds! But it’s only a medium-sized asteroid. It’s basically the chicken fingers of outer space. The upside though is that they get to name it. Raj suggests naming it after their girlfriends, but Sheldon wants to take all the credit and name it Amy. Raj accepts, but only if Sheldon and Amy name all of their future children Rajesh (including girls). Amy might have an issue or two with that, but hey, at least she’s got a lump of rock named after her. On the other side of town, Stewart is finally moving out of Howard and Bernadette’s house. He knows that they’re remodeling so he saved them the trouble of having to kick him out. As Howard and Bernie are talking plans about what to do with his room (man cave or woman cave? ), they find one of Stewart’s stuffed teddy bears, and start reminiscing on the last two years living with him. Things get emotional quick, but they don’t have to worry, Stuart will always be with them. And I mean, he sneaks into their room in the middle of the night just to watch over them. Creepy with just a dash of adorable. It was an episode of new discoveries. 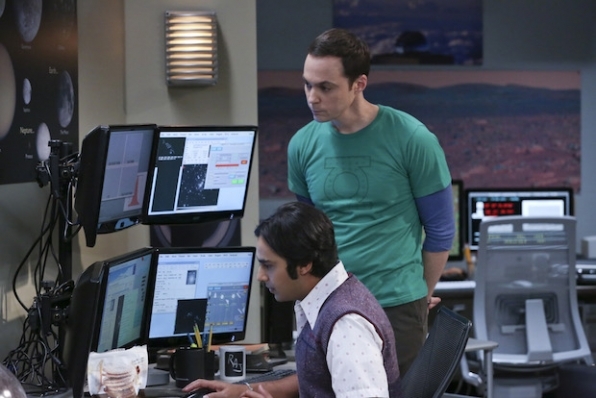 Sheldon and Raj uncover an asteroid, Penny discovers she might be turning into Leonard’s mom and Howard and Bernadette realize they’ll miss Stuart after all. Let’s hope we discover more details on Sheldon and Amy’s night together on the next episode. Next Article'The Boy' Rule of the Day #5 Digital Spot - Watch Now!